Radio is a strange creature in 2014—a seemingly irrelevant medium, one­-upped by the dazzle of CGI and the convenience of the internet. Yet it somehow holds on, barely remaining alive. Or so it seems on this side of the Atlantic. But zip on over to the land of fine wine and cheese and it’s a different story, as radio seems to be doing just fine—thank you—as you can clearly see in Nicolas Philibert’s La Maison de la Radio, a 2013 fly­-on­-the­-wall documentary of the NPR­ish Parisian institution that is government­-funded Radio France. But while NPR’s programming is mostly geared toward an aging, academic baby­ boomer demographic, Radio France remains a much more vital part of the culture… which makes sense. These are the French, after all. Radio France is on the in La Maison de la Radio. The entire film is a seemingly random (but expertly crafted) mish­mash of everything that goes on during a supposedly typical day at the station—sans narration, sans text, sans any guiding narrative whatsoever. We’re talking 99 minutes of people speaking into microphones, mostly, and it remains fascinating throughout, as the snippets of internal conversation and public broadcasts tap into a wide and rich wealth of personalities and subjects. From the daily news reports to on­-location updates at the Tour de France to studio concerts to radio dramas to political debates, La Maison de la Radio is less about what they’re saying and more about the fact that, thank god, someone is still saying it. The filming is so well composed that the radio employees often come off as actors executing a very clever script, yet this is clearly all non­fiction. One has to wonder, however, how much was left on the cutting room floor, since the film gives you the impression of a perfectly oiled machine chugging along. Did Philibert cut out all the friction, or did he simply catch everyone on a good day? 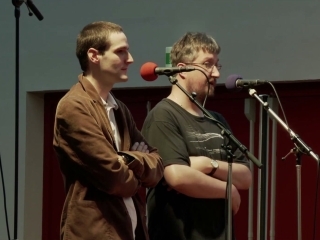 One has to guess the former, since La Maison de la Radio is ultimately a love letter about the art of radio itself, and not about the petty human dramas that we can be sure to exist every day. If the actual content weren’t so interesting, the film would quickly fall flat, but there’re so many cool little tidbits in the forms of interviews and conversations that your mind rarely has a chance to wander. And just when it threatens to, Philibert deftly weaves in moments of subtle humor or wonderful musical performances occurring in their studios—from modern classical to hip hop to weird experimental sound performances. The music is so good, actually, that the film’s lack of a commercially­-released soundtrack just might be its biggest flaw. 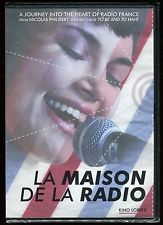 Without the sweet moments of humor or the live music, La Maison de la Radio would have been tough to weather, but the balance between fun and serious only falters a bit near the end of the film, where the lack of a formal structure starts to become an issue. But that’s only for a brief moment; for the most part, Philibert accomplishes his ambitious goal, and the non­-visual medium of radio shines on the silver screen.